There are times we go along thinking that our life in on track and moving nicely, making plans for the future and just being content with where we are. Then here it comes -- a curve ball. It can totally derail your thoughts, your ability in dealing with day to day life and a feeling of grief. Over the years I have had numerous curve balls thrown at me in this journey of life. Moving through each one, facing them head-on, has been the only way I have been able to get through. With each chaotic moment, I find my faith growing and a change in my perspective towards things and people. I believe in the power of prayer. Prayer can be a powerful tool if done with the right heart. Have I seen miracles over the years? Absolutely. I have seen my son, diagnosed with autism who was completely nonverbal when he was younger and told that he wouldn't be verbal until well into his grade school years, start verbalizing by age of four. I have seen my daughter walk away from a car accident that by looking at the car she never should have survived, broken hearts heal, marriages renew and yes, sometimes even fall apart again only to be restored fully in the end. A good friend of mine last night told me that faithfulness brings blessings. Sometimes in the midst of heartache and crisis, we don't see what is right in front of us. So I sit here this morning counting my blessings. The first seven of them are my children and my grandson. Looking around at my life, there are numerous blessings that need to be counted daily. As I sit here in the midst of crisis, I know I am held up by God and I can see the blessings coming out of having a faithful and open heart. I have wrapped up my blog tour for Crashing Hearts and I must say I had a blast doing it. I met some great authors and readers in the process. As I am promoting my book, I am finding there is quite a learning curve with the promotion process. Where do you start? As you know I started with my blog tour. I have used social media, .i.e. Facebook, Twitter, LinkedIn, to help get the word out there. Word of mouth is great as well. There have been some reviews posted on Amazon.com, which is exciting for me to see. As I continue on the journey, I have become more active in Goodreads. This is a site for readers and authors. You are able to review other books, have people review yours and more. At this juncture, I am involved in a giveaway for Crashing Hearts. The link below will get you there if you are interested in trying to win a free book. by Emma Leigh Reed Giveaway ends February 20, 2012. What have you found as authors to be good promotional tools, or as readers what would bring a book to your attention? 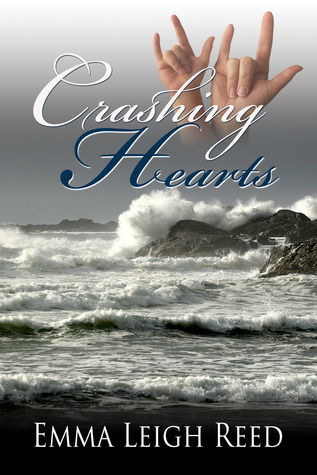 As many of you may know by know, CRASHING HEARTS, was released January 1st via Whiskey Creek Press. I am absolutely thrilled to have my debut novel finally out there. To top off the excitement, I am in the midst of a blog tour to promote CRASHING HEARTS. Please stop by on the following days if you have time. Would love to see you stop by at any of the different blogs and leave a comment. Leave a comment here and you let me know where you will leave a comment on one of the above blog tour stops and you could win a signed print copy of CRASHING HEARTS. Ebooks are available at Amazon or print copies can be ordered directly via paypal here for $12.00 each. I look forward to seeing you around the above blogs. Crashing Hearts is due for release in January. Here's a little tease with the first few pages. Kira Nichols pushed back her hair as the crisp salt air blew it across her face. She walked up the path—her sneakers leaving small impressions in the soft sand—to the cul-de-sac. At the empty lot across from her house, the foundation had been capped over and abandoned for about a year now. She sprang into a run at the rumble of a sports car arriv- ing at a fast clip. She arrived at the cul-de-sac at the same time the vehicle skidded to a stop. She caught her breath as the lean, ruggedly handsome man exited his vehicle. The smile he flashed her was one she imagined had many women melting at his feet. Kira squared her shoulders and approached him. Her five foot two inch frame seemed minute compared to his at least six foot stature. She willed herself to appear calm and not give away that her senses had completely left her at the sight of him. “Grant Rutledge.” He extended his hand to her. His deep voice, like a shot of brandy, was warm and soothing. She swallowed hard, her anger forgotten for a brief second. Then it flared back and she ignored his hand. “Do you have any idea that there are children in this area?” she demanded, planting her hands on her hips. “My apologies if you felt I was going too fast.” He gave an exaggerated glance around. “There aren’t any children about now.” He smiled that smile again and in spite of her anger, her heart melted. She started with the realization he still had his hand extended in introduction. She tentatively shook his calloused fingers. Tingles shot up her arm and she struggled with not yanking her hand away. Heat flooded her face. She prayed he couldn’t tell. Kira turned to go. “I just know the type.” She gestured absently at the car. She forced herself to walk slowly towards her house, feeling his eyes on her back. Her mind whirled. She had practically melted at the sound of his voice. Her cheeks reddened at the thought of him watching her walk away—thankful she had stayed in shape. The solitude of the cul-de-sac was the reason she origi- nally loved this spot. Her house had been the only one in this two-lot area for six years. She hoped the new construction company would be considerate and not disrupt the serenity, and keep working hours to normal business hours, hours when Jared was in preschool. She thought back to the long hours they kept when they put in the foundation. Jared had been unable to sleep due to the noise and disruption of his routine. Hopefully this time around the noise wouldn’t disturb him. He was just beginning to sleep through the night. Jared’s hands and fingers flew in his excitement to know about the new house, and the fast car he saw. “Jared, use your words.” Kira ushered him into the house. “Yes, the car was red, and it’s very fast, so you must stay away from there.” Kira found Barbara’s eyes over Jared’s head, and gave her the “I have so much to tell you” look. “Time to get ready for the day, Jared,” Barbara interjected. “Stop! We are not going to rehash that night and we certainly aren’t going to blame Patrick. He’s gone and nothing is going to change that.” Kira looked toward the ocean and for- got about her coffee and Barbara. For a moment she lost track of the here and now and drifted off into the peace of the ocean. Something caught Kira’s eye, and she turned to see Grant taking measurements, preparing for the construction. Feelings she hadn’t felt in so long flooded her as she watched his dark, wavy hair blow in the breeze. Half sighing, half growling to herself, she turned from the window. Distractions were not what she needed now. There was a routine to follow. For Jared’s sake. Preorders for your signed copy of CRASHING HEARTS can be ordered via paypal here for $12.00 each or contact me directly to arrange payment.